The Bragdon Project uses the digital environment to re-create both the structure and the experience of a building that no longer exists: the main railroad station In Rochester between 1914 and 1963. 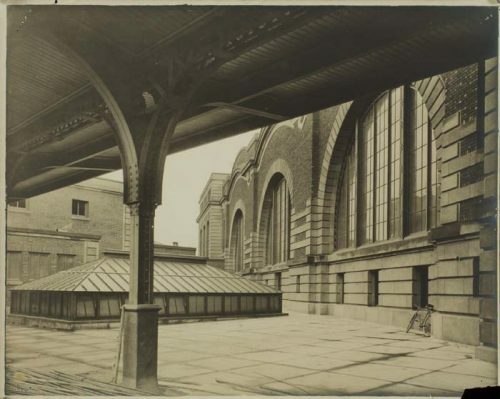 The architect of the train station was Claude Fayette Bragdon, a man notable both for his designs and for his theoretical writings on space. The aim of our project is to use new media to integrate visual images of the station and its component artifacts with text about Bragdon and his ideas, as well as to incorporate memories from individuals who recall using or working in the building. Additionally, The project seeks to resuscitate and proliferate Bragdon’s reputation among American architects. Although he is virtually unknown outside of Rochester, Bragdon is certainly an important figure in the transitional period of early twentieth-century American architecture. Like Sullivan and Wright, he straddles the divide between the Arts and Crafts movement and modernism, and provides an alternative perspective on “organic architecture.” The digital recreation of Rochester’s train station draws the ebb and flow of American industry and the experience of urbanity into sharp focus, challenging those who explore the digital terrain of early twentieth century Rochester to ask questions regarding the relationship between progress, infrastructure, economy, and daily life in regional centers.